How many Amelie’s cafes have you already managed? Have you tried Amelie's Cafe: Summer Time or Amelie's Cafe: Halloween? 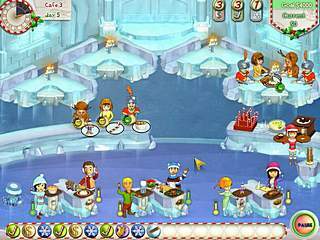 If you’re Amelie’s fan you can enjoy the well-known story-line decorated according to the Christmas playing Amelie's Cafe: Holiday Spirit. And if you’re a new comer, welcome to the Amelie’s world! Taking into account that Alawar Games has already cut its teeth on the café theme, the new release will disappoint neither experienced players, nor the newbies. As usual to in all the games of Amelie’s Café series, you’ll help the heroine do everything from serving customers to decorating the cafe in order to bring new customers in. The only thing that differs from the previous games is that all the decorations will correspond with the Christmas. What is the Holiday Spirit means to you? And for Amelie it means the workers wearing Santa’s hats, X-mas trees, gifts and many other things that will be clear to you while making progress through the game. 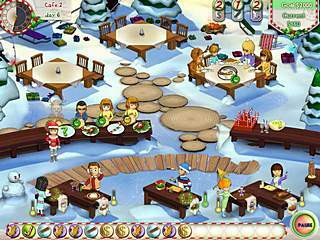 You’ve been playing time-management games for so often that you doubt that Amelie's Cafe: Holiday Spirit will be challenging for you? No problem! You just have to choose Santa Mode. Santa Mode is an advanced difficulty mode in which customers arrive earlier and lose patience faster. Players who beat this mode earn a commemorate mark. Don’t even ask me what it goes about – I spent too much time managing that so hardly I’d give away this secret for free. 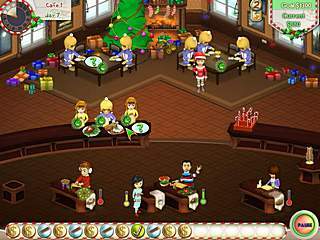 As every time management game does, Amelie's Cafe: Holiday Spirit will make you move as fast as you can and decide on quickly. If you succeed in that, you’ll be provided with the upgrades. You may either renovate the café’s interior or make your workers work harder or neater. By the way the amount of the cookers will increase and if you think, that this will make your task easier, you are mistaken. At the very beginning you are supposed to serve smashed potato, turkey and salad or a combination of two of the mentioned dishes. Then a girl cooking a kind of muffin appears. And then you have to serve candies. And then… But Amelie is still the only one to serve! Thanks God, in the bottom of your screen there is a special line where the images of coins, brushes and candy canes arrive. If you click any of them it disappears, and the rest three of a kind that makes 3 in a raw improve your current situation. Three brushes in a raw make all the tables of your workers clean in a moment. Three candy canes in a raw make all your visitors happy and pleased even if you’re delaying their order (that is my favorite, by the way). And tree coins in a raw make your tips bigger. The name of the game Holiday Spirit describes it perfect. I believe that it creates the proper mood for the winter holidays. Combining both the spirit and action it might be a great choice for a December evening! Oops, I meant to comment on the other blog with the Henry Street bar. lol. Not that this isn't nice. I peferr to read the blog straight from the source, but I don't have an iphone anyway. That's cool you're spreading the foodie love everywhere. This is Amelie's Cafe: Holiday Spirit review. Download this game here.